Oct 28, 2017; Houston, TX, USA; Houston Astros starting pitcher Charlie Morton (50) waves to the crowd as he is relieved in the seventh inning against the Los Angeles Dodgers in game four of the 2017 World Series at Minute Maid Park. Astros' pitcher Charlie Morton has been added to the 2018 American League All-Star roster. 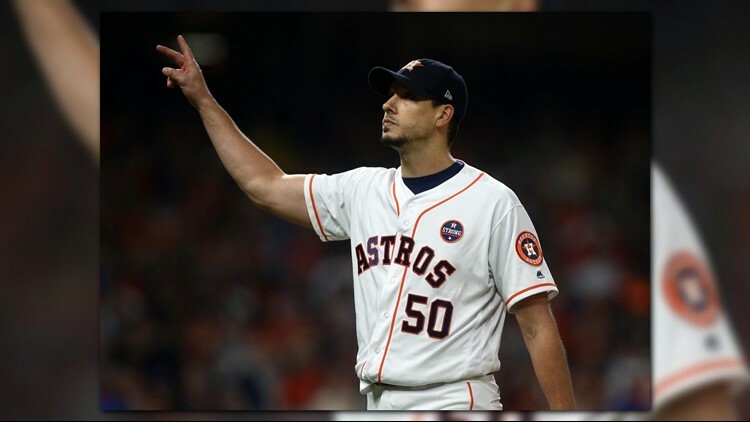 HOUSTON, TX - Astros right-handed pitcher Charlie Morton has been added to the American League All-Star roster, Major League Baseball announced on Friday. season with the Astros. He will replace Aroldis Chapman, according to MLB. The league also announced Blake Snell will be on the roster as well and will be replacing Corey Kluber. Both Chapman and Kluber are full All-Stars who will be in attendance, but they will be inactive for the game, MLB said. Among all AL pitchers this season, Morton ranks second in winning percentage (.846), third in strikeouts per 9.0 innings (11.70), tied for fourth in wins, sixth in strikeouts and ninth in ERA. With Morton on the roster, there are now six All Star players including Jose Altuve, Alex Bregman, Gerrit Cole, George Springer and Justin Verlander. The Astros are the only team in the Majors with six All-Stars this season and it marks the second time in franchise history that the Astros have had six All-Stars on one squad, as they also had six All-Stars last season. The 89th MLB All-Star Game will be played on Tuesday, July 17 at Nationals Park in Washington, D.C.